A FUN way to celebrate Thanksgiving! 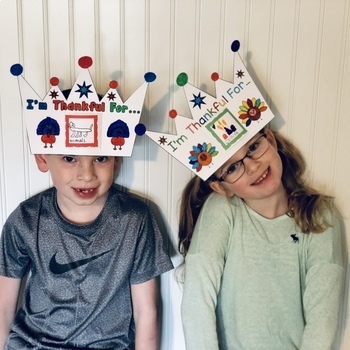 This DIY “I’m Thankful For…” crown is ready to print, cut, color and glue. No staples necessary, so there will be no sharp edges. 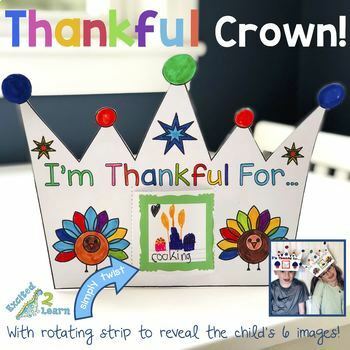 This customizable crown has a rotating strip to reveal new drawings and writing that the child has created to show what he/she is thankful for in his/her life. 1st Decorate your base crown. 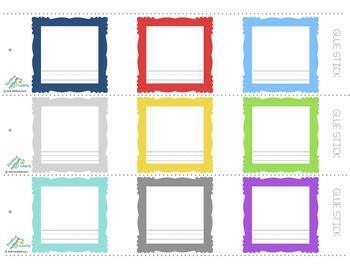 2nd Cut out 2 (possibly 3 for older children) strips of 3 squares by cutting on the dotted lines. A teacher can help cut off any extra white so it is easier to slide through, if need be. 3rd Have a teacher cut the 2 dotted lines on the crown (I used on X-ACTO knife), if not already done. 4th Use a glue stick to glue 2 or 3 strips together (depending on the size of your head) by gluing the *s on top of the “GLUE STICK” label to make a long strip. 5th Slide the strip from the back through one slit with the images upright and then, back through the other. Then glue the final * to the “GLUE STICK” label to make a loop. 6th Pick the image you want displayed first and have a very HAPPY THANKSGIVING!! !